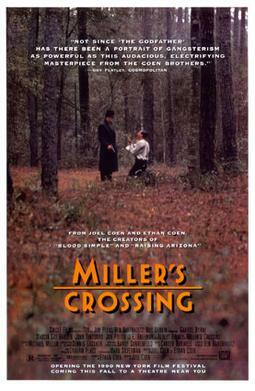 Miller’s Crossing is a film that I wouldn’t have rated 5 stars the first time I watched it, albeit I really enjoyed. It’s a film that rewards repeat viewings, and this watch, my third, cements it as a masterpiece and one of the finest films the Coens have made. If anything, this film presents a perfect case for the value of rewatching quality films to gain deeper enjoyment from them. Miller’s Crossing is a gangster film from the Coen Brothers that focuses on Gabriel Byrne’s Tom Reagan, a long time confidante of Albert Finney’s political boss Leo O’Bannon, caught between two rival factions in a power struggle. The film works so well by developing an incredible atmosphere with some brilliant cinematography (particularly out on the area known as Miller’s Crossing) coupled with a terrific score. The film effectively follows Byrne’s character and how he manipulates the situation to his advantage, as he plays the various characters off each other. It’s a completely different film from most of the Scorsese inspired gangster movies of the last twenty years or so, with a very old fashioned feel to it (it is set during prohibition after all). It’s a film largely driven by some tremendous performances from Albert Finney, Gabriel Byrne, John Turturro and the standout in Jon Polito’s Caspar. My only criticism could be that for all it’s terrific look and atmosphere, it is a little confusing at times and some characters are discussed an awful lot before we can even relate to who they are (John Turturro’s Bernie for one), but this is something that repeat viewings overcome and it’s a richer experience for it. There’s something about the Coen Brother’s style and ability to create an atmosphere that really draws you into a story, and this is one of their finest examples of this kind of storytelling. From the humour of Caspar and his son, to the stunning ‘Danny Boy’ scene, this is an exceptional piece of filmmaking.